5th Class response to Shel Silverstein's poem Rock n Roll Band ! Lá Fhéile Pádraig dhaoibh go léir Ó Rang a Cúig ! 5th Class and their elves wish you all a very happy Christmas & New Year ! Intel Mini Scientist Competition 2016. An excellent project entitled How The Body Works was presented by 5th class students Laura Hayes and Danita & Danila Okubanjo. Well done girls! Michael Corry who recently summited Kilimanjaro visited 5th class to share his experiences of Carrantuohill, Everest and Kilimanjaro! The children really enjoyed seeing all the pictures and equipment. The artic sleeping bag was a big hit as were the walking poles, volcanic rocks and headlight. Leaf Art by 5th Class in response to the book Leaf Man by Lois Ehlert ! During Friendship and Anti Bullying Week Oct 24th to 28th, Ms. Casey's Fifth Class enjoyed paired reading with Ms. Byrne's Junior Infants & Mrs Cotter's Senior Infants. 5th Class participated in Bank Of Ireland's entrepreneurship skills workshop BizWorld Oct 17th & 18th culminating in presenting their projects in the Dragons Den to dragons Shane O'Donnell (Clare Hurler) and Aoife Murray (Bank of Ireland). 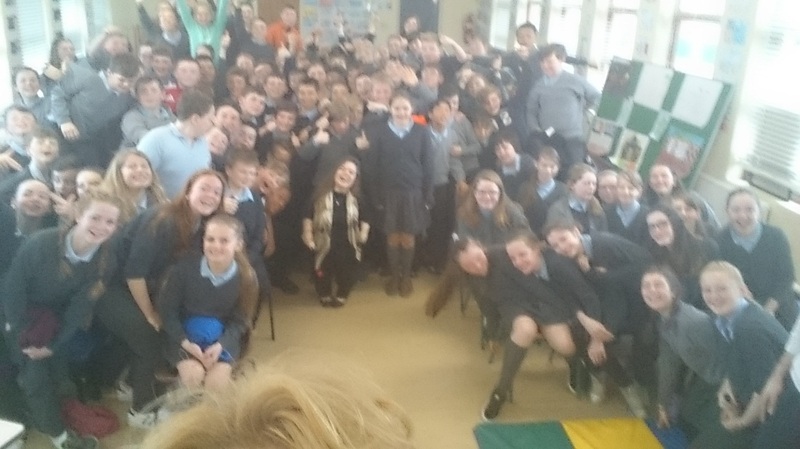 Sinéad Burke gave an inspirational talk to 5th and 6 classes on April 8th. 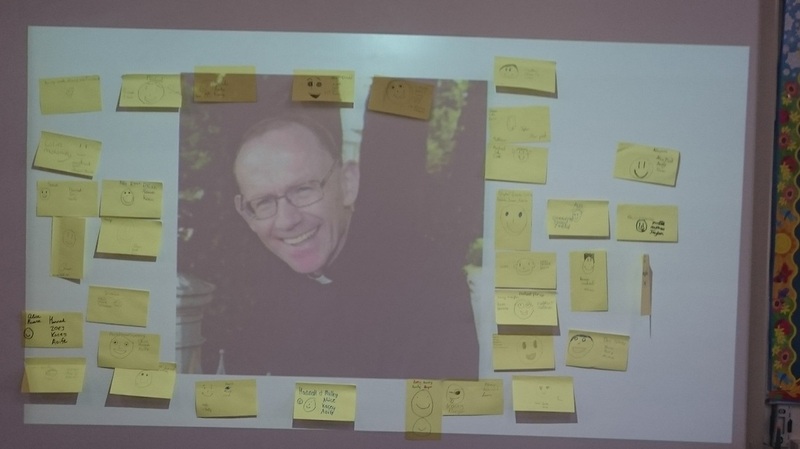 At the end the students asked some excellent questions..
Aidan Courtney cartoonist and writer based in Co.Clare facilitated a bi-lingual workshop in Sixmilebridge library on Thurs. Mar. 10th. Bhain na daltaí a lán taitnimh as. Mar 4th during Engineers Week Rob Stephen explained about software programming . 5th & 6th thought it was great fun and very interesting ! 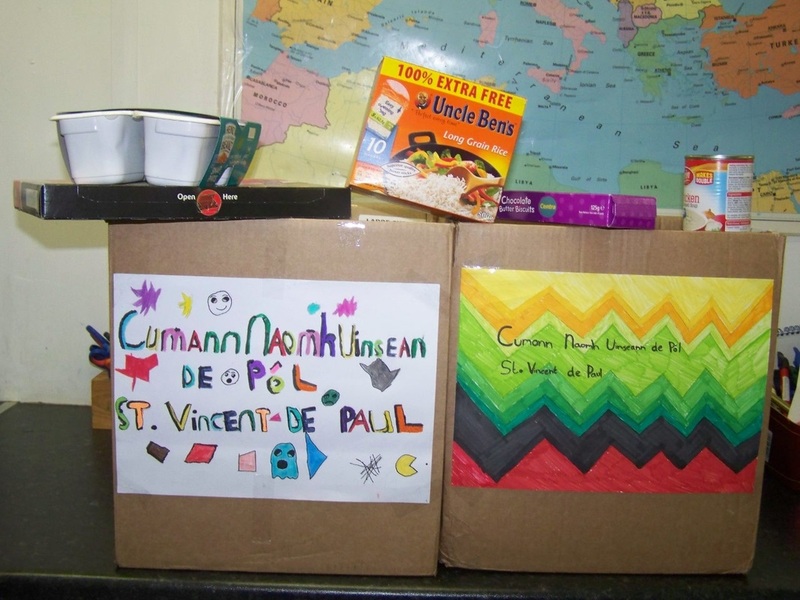 5th Class arranged a food collection for the local branch of St. Vincent De Paul / Cumann Naomh Uinseann De Pól. Well done for thinking of others !! Rang a cúig ag déanamh maisiúcháin na Nollag. Nollaig Shona daoibh go léir. !!! Emily Kate Moore secures place in the All Ireland Final of Intel Mini Scientist Competition !! ​5th Class learned about Dia de los Muertos ( Day of the Dead ) . It occurs on Nov 1st and 2nd to coincide with All Saints and All Souls Day when we celebrate fhe lives of those who have died. The pupils learned about Mexico and where it is in the world and also learned some Spanish words such as calavera ( skull ) , ofrenda ( altar ) , Dan de Muerto ( special bread ) . The children made an ofrenda ( altar ) in the classroom with candles , food, water and skull ornaments. The children also made their own suga​r skull masks ( pictures below ) . Thanks to student teacher Ms. Murray for sharing this very interesting topic with our class. Kim grew up in Canada and currently lives in North Clare. Her first novel FINDING A VOICE was nominated for the Bookseller's inaugural Young Adult Book Prize earlier in 2015 and was inspired by her experience in teaching, therapy and community support work. Her second novel PLAIN JANE will be published in the spring of 2016. Today Kim facilitated an excellent writing workshop with 5th class helping students to find their own writing voices. The pieces of writing that the students shared at the end of today's workshop were truly inspiring ! 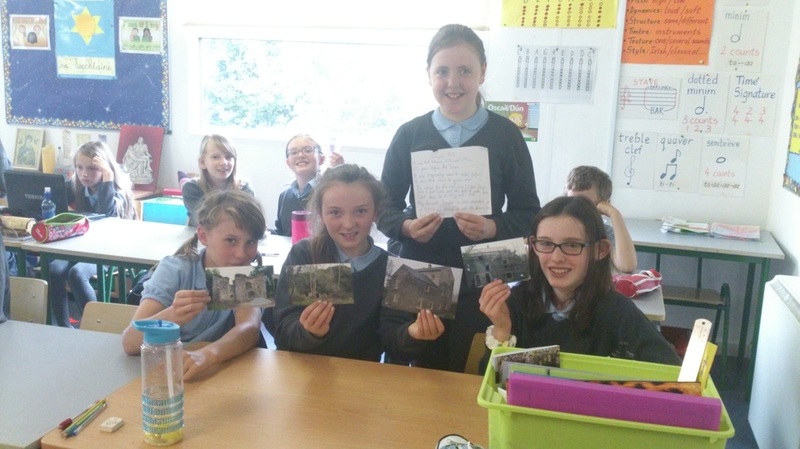 5th Class Students share some family history. During September 5th class studied the work of archaeologists in History and in English started to read the class novel Private Peaceful which is based on WWI. 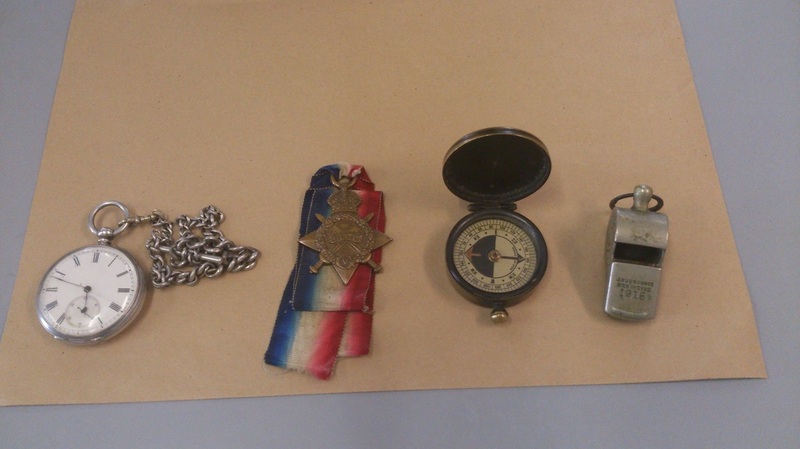 This prompted students Hayley Keogh and Amy Mitchell to share some family history with the class. Hayley told us about Annagore Mill . It was built between 1730 and 1740, 100 years before the Famine. It was originally used to make paper and to grind corn. The wheel from the mill was 10ft. ( 300 cms ) long and 2 ft.( 60 cms ) wide and the fall of water was 5 ft.( 150 cms ) deep. Amy shared her Great Grandad's World War 1 story with the class. Tom Mitchell fought in the First World War. His troop were the South Irish Horse and were a horseback troop. One of the pictures you will see below is of Tom and his troop at Limerick Army Barracks before they left for the war. There is a website dedicated to his unit, southirishhorse.com and a memorial in St.Patricks Cathedral in Dublin. Tom went on the train to Dun Laoghaire and then across to England by boat and onwards to France. It is believed Tom fought on the western front. 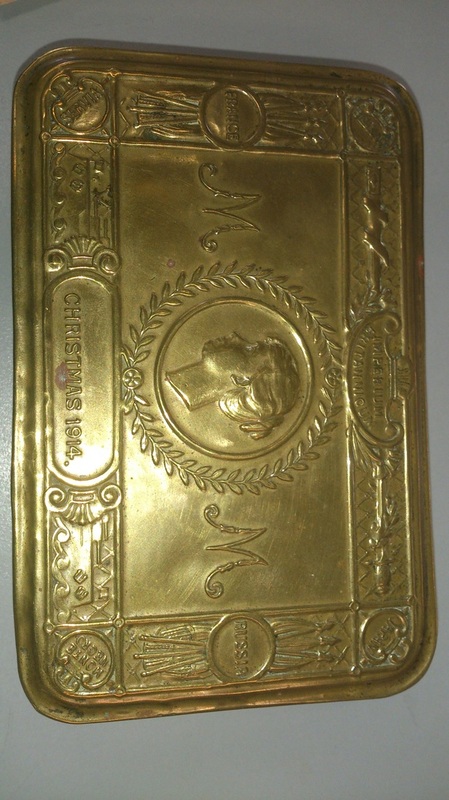 Tom got a box of tobacco from the Queen at Christmas ( pic.below ) and it is in this box that Amy's family keep his whistle, compass, pocket watch and medals ( pics below ) Toms wife Amy's great grandmother only died in 2006. She is buried with Tom in Co.Kildare. They had 7 children and were from Abbeyleix Co.Laois. Some more scenes from Private Peaceful ! 5th Class are currently reading the novel Private Peaceful by Michael Morpurgo. 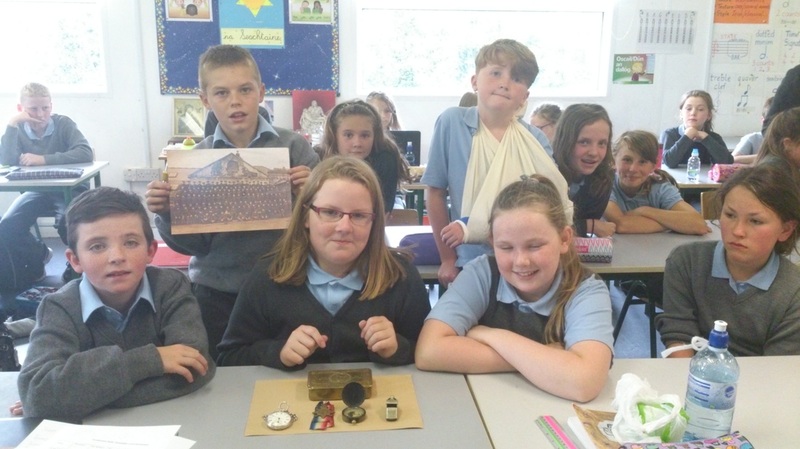 Over the last five weeks the class have been engaged in an art project which involved sketching their favourite scenes from the novel, creating Diorama boxes of these scenes, making the characters and props from clay and finally painting and glazing the pieces. Hope you all enjoy looking at the scenes! 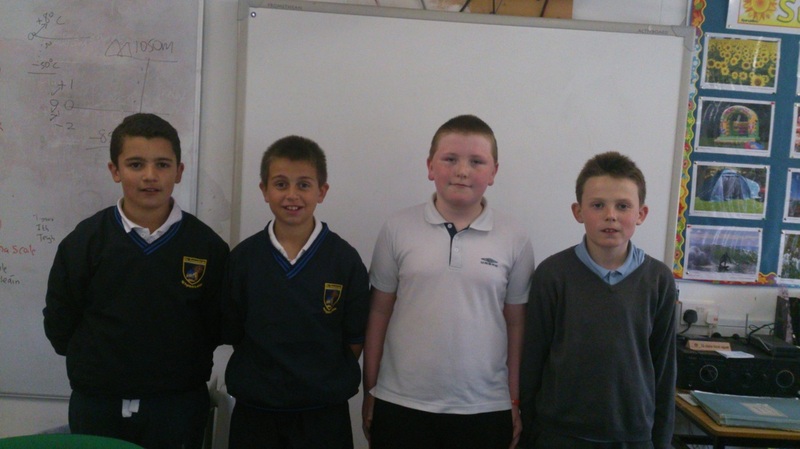 Continuing our look at famous people from the past , Samuel, David, Liam and Ciaran delivered an excellent presentation to the class on the life of Nelson Mandela.. The graphics used were super. 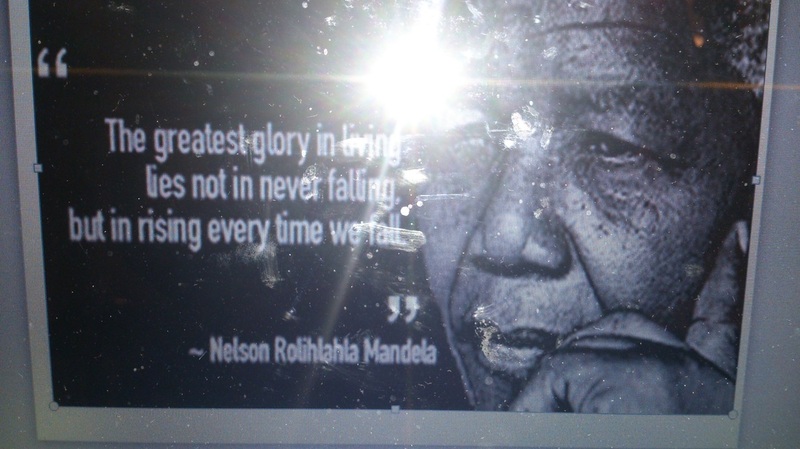 They told us that Nelson once said " The greatest glory in living lies not in never falling but in rising every time we fall"